There is a swimming pool in Port Erin, the old Victorian tourist town on the Isle of Man, that is now empty and ghost-like. It was once an ideal spot to swim and watch the sea. Check out this photo. 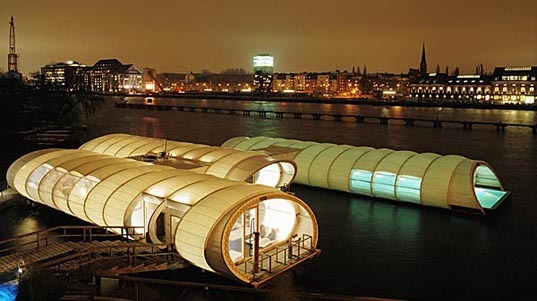 Reuters reports: Berlin's city skyline is seen behind the futuristic designed 'Badeschiff' (Poolship), a floating sauna and swimming pool, on the Spree river in Berlin November 3, 2006. The extraordinary public bath is transformed during winter time into a sauna landscape. Click for another photo. Roubaix’s out-of-the-ordinary and simply breathtaking art museum, La Piscine, is the pride of the city today. “There’s no question that La Piscine is Roubaix’s gem,” says Alexandre Alibrandi, a guide and researcher at La Piscine (formally called La Musée d’Art et d’Industrie). More, from France Today: La Piscine now houses works by artists from Picasso to clothing designer Paco Rabanne.